Brent Newton is an airplane mechanic by trade. When he was driving on his way to a job in Texas, he discovered a drive-up ice machine that was made by IceBorn. When Brent moved up to Minnesota to be closer to his children, he noticed that there weren’t any drive-up ice machines in the state. 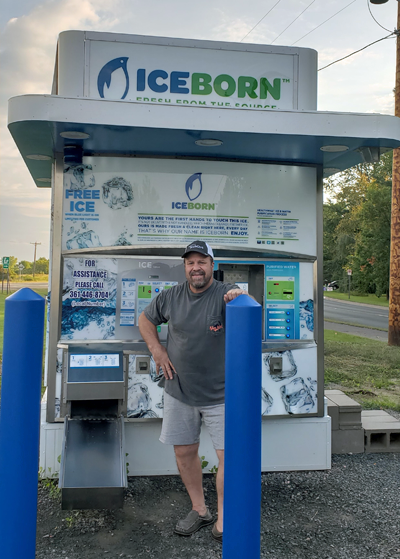 He decided to purchase an IceBorn machine and put it up in Chisago City, Minnesota. Brent did his research and spoke with the owner of several IceBorn machines in Williston. After speaking with him, he figured it would be a no-brainer to pursue financing an Ice House America machine. When Brent was pursuing a bank for financing, he came upon Stearns Bank and SBA lender Al Schultz. From the beginning, Brent knew he was working with someone who understood what he was trying to accomplish. Brent got his IceBorn machine up and running just after July 4, 2018. The machine is 8x16 feet long and 11 feet high. It’s a kiosk where customers can drive up, put money in and select the amount of ice (in pounds) they want. Customers can also purchase water up to five gallons at a time. IceBorn uses reverse osmosis to make the ice.